Doctor Who’s latest adventure sees him teaming up with a Dalek and trying to save the universe, but also teaching children some early computer programming skills. This isn’t a TV show, however: it’s a game due to launch on Wednesday 22 October on the broadcaster’s CBBC website. The Doctor and the Dalek includes voice narration from current Doctor Peter Capaldi, and a new story by Phil Ford, who has written for the TV show. The free web game is aimed at 6-12 year-olds, and involves freeing a battered Dalek from a ship of Cybermen, then building it back up to full strength through puzzles based on the programming elements of the new English computing curriculum. In an age where everything can be “Googled” and online privacy no longer exists, students have a whole new reputation at stake—their digital reputation, or their digital footprint. A digital footprintis any online information about a person that can be searched, shared, and seen by a large, invisible audience. The terms of service, also known as the document you’re supposed to read before signing up for a site or platform, is a treasure trove of legal guidelines, rules and permissions that few people really care about. But there are a few things you’re agreeing to, hidden within the jargon, that might change the way you use the web. Some permissions, like keeping personal information, protecting copyrights and preventing impersonation, are well-known and relatively innocuous. That said, there’s a chance you’re violating a term of service without even realizing it. Here are 10 things you didn’t realize you agreed to in the social network terms of service you didn’t read, but we did. YouTube has a firm place in the current classroom. From Khan Academy’s videos to YouTube EDU and beyond, there’s a reason all these videos are finding a home in schools. In an effort to help keep the ball rolling, Google just launched a set of 10 interactive lessons designed to support teachers in educating students on digital citizenship. A topic obviously quite close to Google’s heart. Google (which owns YouTube) built the lessons to educate students about YouTube’s policies, how to flag content, how to be a safer online citizen, and protect their identities. 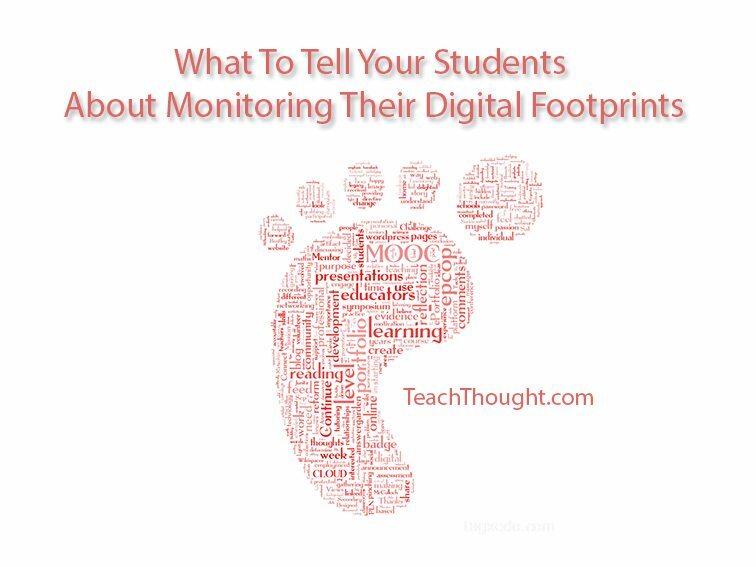 11 Tips For Students To Manage Their Digital Footprints is an interesting read from TeachThought.com and the advice applies as much to us as adults and teachers as it does to students. Don’t know what a digital footprint is? Simply put, a digital footprint is the record or trail left by the things you do online. Your social media activity, the info on your personal website, your browsing history, your online subscriptions, any photo galleries and videos you’ve uploaded — essentially, anything on the Internet with your name on it. The advice includes the obvious, like using privacy settings in Facebook, to less well-known information about how Google records and uses our search history. I encourage you to have a read and share the information with your students and others as appropriate.